Colorful corn can be seen decorating doors and table tops during the fall season, but how much do you really know about the corn that is known variously as Indian, flint, ornamental, or even calico? According to Wikipedia, flint corn has less soft starch than dent corn and does not have the dents in the kernels. Flint corn is one of three types of corn cultivated by Native Americans – from whence the Indian corn moniker comes. Cultivation of flint corn was typical to tribes in New England and across the northern tier, including by tribes such as the Pawnee on the Great Plains. But, archeologists have found evidence of such corn cultivation by the Pawnee and others before 1000 BC. Cultivation of corn occurred hundreds of years earlier among the Mississippian culture people, whose civilization arose based on population density and trade because of surplus corn crops.There is also evidence that flint corn was grown in China, India and South America for centuries. While we use the colorful ears for decoration, our ancestors actually ate it and it is still eaten in countries like Argentina and other areas of South America, Latin America and southern Europe. Heavy in starch, it can be compared to hominy, which is used to make grits. Indian corn can be ground to make flour, or the whole kernel can be reserved for popcorn. It can also be used as livestock feed. Indian corn for decoration these days is the result of several hybrid varieties developed within the last 50 years. Calico-patterned or speckled varieties of Indian corn result from cross-pollination of single-shaded plants. In addition to the multicolored ears, there are solid ears in shades of white, ruby, blue and black. 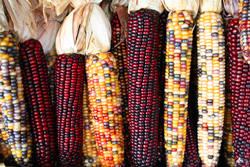 Many varieties have names as colorful as the corn – like Autumn Explosion, Robust Ruby Red, Big Chief and Glass Gem. There are even miniature varieties with cute names like Indian Fingers, Cutie Pops, Little Boy Blue and Miniature Blue, Cutie Pink, Little Miss Muffet, Little Bo Peep and Miniature Pink.